1. Check the science guidelines. What kind of project does your science fair require? There are five kinds of science projects: investigative (experimental), demonstration, research papers or reports, models, and collections. (For more information on all the types of science projects, get a FREE Parent’s Guide to a Science Project at www.24hourscienceprojects.com). Are there restrictions on projects? Is there a ‘money spend’ limit? Can you use animals or food in the experiment or in the display? Does your child have to demonstrate the project for a judge? 2. After you know all the particulars for your science fair, make a list or projects ideas that meet the requirements. Try to get projects with a variety of science topics. You may want to do this before your child gets involved, so you won’t have to say “No – not suitable” so many times. 3. Look through your list of science project ideas, and eliminate the ones that look too complicated or hard to do. Remember, your child is supposed to do the project with your assistance only. Check the list of supplies. Are they readily available? Are they affordable? Do you have enough time to complete the project? If the science project is due next week, you don’t have time to study the long term effect of anything. Make sure the science you you are learning about is on your child’s level. Your child should be able to have a basic idea of the underlying scientific principles. Science projects for elementary school students probably shouldn’t involve advanced biology. 4. Finally, let your child choose the science project idea that he or she likes the best. And have fun with your new science project idea! STILL NEED AN IDEA? CLICK HERE! P.S. 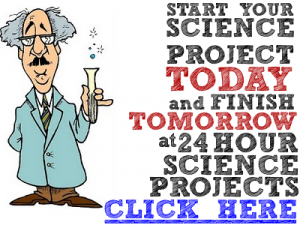 Find out how to get a FREE Parent’s Guide to a Science Project at www.24hourscienceprojects.com. Share about the project guides! My name is Kayla Fay, and my husband and I have four sons. We’ve turned in over 25 science projects. We remember the disappointment of having an experiment fail. We know how frustrating it is to search for a good project at the last minute. The five 24 Hour Science Projects have experiments our sons have completed successfully. The project guides will help you have the same success with your science experiment! Five Fast and Easy Science Project guides that can be started today and finished tomorrow! Your science project guide has step by step instructions, easy to find supplies, lists of reference materials and pre-formatted charts and graphs! Get started on your project now!